Also, don't forget to enter the 31 Bits Necklace giveaway! In other, more happy, news, my mom is awesome! Remember those amazing OASAP jeans, seen in my Karl Addict post? 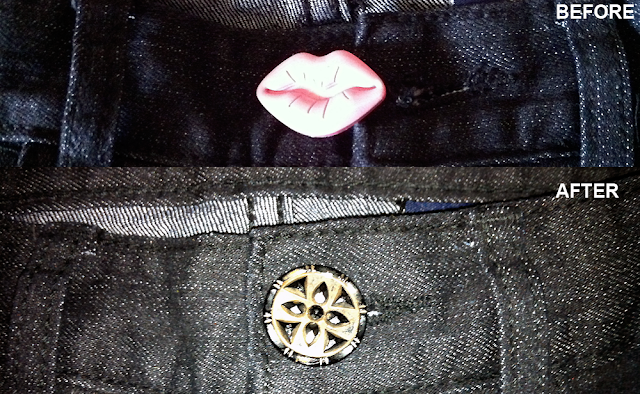 I love the jeans, but the button (a pair of lips) was a bit odd for me, so I went through my Mom's buttons and found a cool, more edgy ones and she changed them for me. Haha, love the new button, and yeah I hope we are able to find ourselves jobs we can feel excited to go to soon. Still, you looked great all week - you definitely put in more effort than I did. Sorry to hear about your crappy week at work - I've had an absolutely horrific at well and I am also thinking about new career options so I sympathize. Hope that you will found a new job that suits you better! Love you outfits! Especially the first one! Killer shoes always make the week at least a little bit better...those leopard miu miu ones are amazing! Sorry about your crappy week...it is almost the weekend! Love the outfit from Monday! I feel ya! This week has blown chunks. I cant wait for the weekend so I drown my sorrows in booze and dance parties. Have a great weekend! I have to tell you that I'm in total love/lust with your Miu Miu heels. They are killing me. Sounds like you need to get some rest this weekend. I really like Monday's blazer. Oh dear! You look lovely! Life is too short if you don't like your work quit and get a new one! Your outfit on Thursday was absolutely amazing! And I am sorry your work week wasn't that great girlie. I love the new button! It is very chic and takes away the cheese factor of the kiss lips. Love those leopard print heels! I'm sorry to hear about your week!! That stinks! Don't let that get you down, girlie...Fab outfits especially the one with the army green skirt from our shopping trip...and the shoes?! HOLLA! I like the button change..definitely definitely makes it classic and chic! Hope you have a wonderful weekend to make up for your work week! I just stumbled across your blog and I am in love! I love the layout to the content and everything in between! I am your newest avid follower! Gorgeous as always...Those Miu Miu shoes are amazing! I love the cardigan that you had on thursday, so chic. Cute bag, I love Marc Jacobs! I hope your boss is not reading this!! Nice outfits, my favouite is wednesday. I hope things at work get better! Your dress from Wednesday is jaw droppingly amazing! Hope you are enjoying the weekend! That purple bag is amazing! Great pop of color! I love that purple bag! Too bad you had a bad week, hope next one become a lot better. And aww to your mum, so nice of her to change the button.